Neural representations, or neurotags, refer to the idea that networks of brain cells, distributed across multiple brain areas, work in synergy to produce outputs. The brain can be considered then, a complex array of neurotags, each influencing and being influenced by each other. The output of some neurotags act on other systems, for example, movement, or on consciousness, for example, pain. This concept of neurotags has sparked a new body of research into pain and rehabilitation. We draw on this research and the concept of a cortical body matrix—a network of representations that subserves the regulation and protection of the body and the space around it—to suggest important implications for rehabilitation of sports injury and for sports performance. Protective behaviours associated with pain have been reinterpreted in light of these conceptual models. With a particular focus on rehabilitation of the injured athlete, this review presents the theoretical underpinnings of the cortical body matrix and its application within the sporting context. Therapeutic approaches based on these ideas are discussed and the efficacy of the most tested approaches is addressed. By integrating current thought in pain and cognitive neuroscience related to sports rehabilitation, recommendations for clinical practice and future research are suggested. Sports injuries and the pain associated with them often lead to reduced movement and reduced participation in sporting activity. A reduction in movement might occur because of a physiological impairment (eg, reduced range of motion or muscle strength), external immobilisation (such as splinting or bracing), for fear of pain provocation, because of implicit instruction from a health professional or because of fear of further injury or re-injury. Usually, rehabilitation involves gradually increasing movement, strength, endurance and skill, until the athlete is able to fulfil all the requirements of their chosen activities. The focus of sports rehabilitation is, understandably, on loading the tissues in a graded fashion until the athlete and their sports medicine team, are satisfied that they can withstand the requirements of recommencing sport. Another effect of sports injury that is less readily considered in sports rehabilitation, is the state of the various cortical representations that subserve proprioception, movement, the body and peripersonal space. That is, the role of the brain in movement planning, preparation and execution, and the graded exposure of such neural mechanisms when returning to sport after injury. Here we discuss the potential application of current concepts in cognitive and behavioural neuroscience related to pain, movement and bodily awareness, to sports rehabilitation. Movement and motor performance involve highly complex interactions between the neural networks in the brain that represent our body and the space around us.1 For example, skilled motor performance utilises neural representations from visual, proprioceptive, spatial and tactile domains, enabling us to establish body position and alignment in relation to the external environment. Such information gets continually fed into sensory-motor loops that constantly update internal predictions about the outcome of a motor command. This continuous updating promotes smooth, efficient and accurate motor performance2 as well as optimal protection and functionality.1 Both a wide repertoire of possible motor strategies, and a precise and efficient cortical predictive modelling capacity, are considered important for high level motor commands such as those required in sport.3 Finely tuning such a system after injury or inactivity involves reinstating the capacity of the brain to integrate these multiple representations and rapidly run them in a constantly changing and updating sensory-motor environment. The implications of this neurological component to sports rehabilitation depends on fundamental matters of neural representations and their governance. Neural representations, networks or ‘neurotags’4 are large groups of brain cells that are distributed across multiple brain areas and that are thought to evoke a given output. 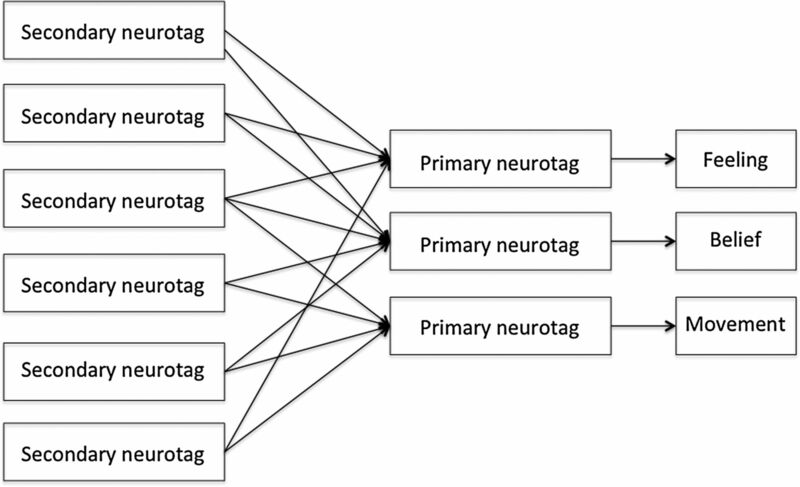 The concept of neural representations is a theoretical one, but the theory is informed by a very large body of empirical data from fundamental neuroscience research using brain computer interface, for example,5 in vivo animal studies and modelling.6 Available human neuroimaging research is also supportive.7 Conventionally, a neurotag is labelled according to its output.6 Each neurotag consists of numerous brain cells, which can be called member brain cells; each member brain cell is part of multiple neurotags. A useful analogy for the concept of neurotags is that of an orchestra—member musicians contribute to many pieces (outputs) and each piece (output) involves a group of musicians distributed across the orchestra (see ref. 4 for a comprehensive account of this metaphorical conceptualisation). Secondary neurotags are those that exert their influence over primary neurotags. Primary neurotags are those that evoke an output, for example, a motor command, a feeling or a conscious belief. A very large number of empirical studies have led to the proposal of a cortical body matrix—a network of neurotags that subserves the regulation, control and protection of the body and the space around it, on both a physiological and a perceptual level1 (see also refs 11 ,12 for relevant reviews). Extensive review of the original experimental and clinical data that underpin the cortical body matrix theory is beyond the scope of this paper, but the theory is captured to some extent by several key findings. For example, (1) people with pathological arm pain and the feeling that the arm was swollen performed painful movements of their hand under four conditions: watching the arm through a magnifying lens so that the arm looked more swollen, watching it through a ‘minimising lens’ so that it looked less swollen and two control conditions.13 The pain and swelling evoked by movement was greatest in the magnified condition and least in the minified condition even though the movements themselves were identical; (2) when healthy volunteers experience a cognitive illusion in which one hand seems to have been replaced by an artificial counterpart, then the hand that has been ‘replaced’ becomes cooler14 and hyper-reactive to histamine in a limb-specific manner that is positively related to the vividness of the illusion;15 when the limb is first cooled, the illusion is made stronger;16 (3) when amputees with an intact phantom limb learn how to perform a biomechanically impossible movement with their phantom limb, they report simultaneous shifts in the internal structure of their phantom and the ability to perform the movement. What is more, some physiological movements are rendered more difficult in line with the new structure of the phantom;17 when people with pathological arm pain and an associated cold arm cross their hands over the body midline, then the painful hand warms up and the healthy hand cools down relative to the healthy one and this effect depends not on where the limbs actually are, but where they are perceived to be.18 ,19 ,20 Each of these findings demonstrate a tight connection between our bodily feelings, for example pain, swelling, location and ownership, and physiological regulation, for example, movement, swelling, temperature control and inflammatory responses. The pertinence of the cortical body matrix theory to return to sport after injury is threefold: (1) it provides a working model that integrates the complex proprioceptive, motor and spatial representations that are involved in sport, particularly those sports involving equipment (eg, balls) or athlete-to-athlete interaction; (2) it stipulates that neurotags, the outputs of which act on end organs (eg, muscles or blood vessels) are closely integrated with neurotags, the outputs of which are feelings (eg, a feeling of warmth, or pain); (3) it implies that both external and internal events or situations, including the location of body parts, are mapped spatially according to a frame of reference centred about oneself (‘egocentric’),18 ,19 ,20 and according to a frame of reference centred on an external object or limb (‘allocentric’).21 This implies that spatial tasks that interrogate both frames of reference should be incorporated into rehabilitation. Proprioception provides an excellent model with which to understand the idea of secondary neurotags influencing primary neurotags. For example, proprioceptive awareness (where you feel a body part to be) can be considered the output of a primary neurotag. There are many influences on this primary neurotag, for example, that from visual input, somatosensory input (that detected by mechanoreceptors and proprioceptive organs in the peripheral nervous system) and internally generated inputs related to effort and force.22 Each of these inputs onto the primary neurotag is generated by secondary neurotags. These ideas have been explored previously in the body localisation and motor control literature where the terms ‘stability’ or ‘reliability’ of the modality are reasonably analogous to the neuronal mass and precision of the subserving neurotags. In particular the Maximum Likelihood Estimation theory23 states that the nervous system combines the information coming from the different sensory modalities in a statistically optimal fashion. Generally speaking, when both vision and proprioception are available at the same time, vision dominates the output, suggesting that the vision-specific neurotag carries much greater influence than the somatosensory-specific neurotag, according to their relative neuronal mass and precision. This predominance of visually encoded neurotags over somatosensory encoded neurotags can be readily observed in illusions that exploit the usual strength of vision to render the perceived location of a limb inaccurate. For example, in the Disappearing Hand Trick24 participants are encouraged to look at their hands and maintain their position relative to a visual cue, but are naïve to the experimental trick that means their hands are actually moving such that the felt location of one hand is rendered completely inaccurate. In this scenario, the neuronal mass and precision of the visually encoded secondary proprioceptive neurotag far outweighs that of the somatosensory encoded one, such that the hand is felt to be in the location the visual system suggests it to be, even though it is not (figure 2). Localisation of a limb and performing a task, as conceptualised according to neurotags and the principle of neuronal mass and precision, together constituting the strength of the neurotag and its resultant influence over the primary neurotag. Here, the weight of the lines denotes neuronal strength, itself a reflection of the number of neurones in the neurotag and its synaptic efficacy, which determines its influence over the subsequent primary neurotag or end output. During localisation of the limb and task performance, the neurotag that represents the visually identified location of the limb is very strong and exerts a greater influence than the neurotag that represents the somatosensory or proprioceptively identified location of the limb, over both the feeling neurotag (where does it feel to be?) and the movement neurotag (what motor command will achieve the correct trajectory from the limb's current location). The third principle of neurotags—neuroplasticity—imparts its effects by modulating both the strength and precision of neurotags. This is a critical consideration during rehabilitation because neuroplasticity ‘works both ways’ on neurotags—to increase or decrease the likelihood of their activation. According to the principle of neuroplasticity, changes in the movement and behaviour repertoire lead to motor learning such that the ease with which different motor outputs are generated is altered in a use-dependent manner. The less active a particular neurotag, the weaker and less precise it becomes; the more active a particular neurotag, the stronger and more precise it becomes (up to a point, at which member brain cells appear to become ‘disinhibited’25 or imprecise, which has potentially profound implications when considered within the cortical body matrix framework—see below). These fundamental matters—of neurotags and the cortical body matrix—present three important implications for sports rehabilitation: that by remaining cognisant of the principles that govern neurotags, we can appreciate how (secondary) neurotags related to actual or implied danger can influence (primary) neurotags of motor output; that by exploiting these principles we can more effectively find the optimal balance between protection and rapid return to full performance and we can ensure that the neuroplastic effects of altered activity can be limited by integrating ‘virtual rehabilitation’ into physical rehabilitation; that by remaining cognisant of the tight and bidirectional link between neurotags that produce body-related outputs and those that produce feeling-related outputs, we can use one to modulate the other. To appreciate the potential importance of these implications, let us consider the relationship between pain and motor output. The dominant paradigm is that pain causes altered motor control. We contend that this paradigm implants a false hierarchy in which pain is considered a lower order event that occurs to an individual, and that motor control will normalise if pain is eradicated. That motor control changes might also cause pain depends on nociceptive stimulation and the completion of a ‘vicious cycle’. We suggest instead that pain and motor control are outputs of primary neurotags, intimately linked but not hierarchically differentiated. We contend that both are modulated by a range of secondary neurotags (figure 3A). The common experimental paradigm that underpins the dominant model involves nociceptive stimulation, which evokes both pain and altered motor output.26 ,27 We are among those who have naively attributed alterations in motor output to pain, when the design does not allow us to differentiate pain from nociceptive stimulation. That is, we mistake association for causation. There is now a compelling body of literature that points to the problems with the dominant model at a theoretical and empirical level28 ,29 ,30 (also see ref. 31 for the theoretical underpinnings of this contention). Nociception is neither sufficient nor necessary for pain. That is, activity in primary nociceptors—high threshold free nerve endings located in the tissues of the body—and their projections, which are collectively responsible for detecting, transforming and transmitting a danger message to the brain, is now considered just one contributor to pain. We suggest that the same applies for protective motor outputs—nociception is just one contributor, albeit an influential one, to protective motor outputs (figure 3B). (A) The dominant, but we contend less accurate conceptualisation of the relationship between pain and motor control using the model of neurotags. Here, movements are considered a consequence of pain, instead of a closely related but independent output of the cortical body matrix. Line weights denote the differential influence of different secondary neurotags on the primary neurotag. (B) Conceptualisation of pain and motor control according to the influence of secondary neurotags. Line weights denote the differential influence of different secondary neurotags on the primary neurotag. Here, secondary neurotags driven by nociception have greatest influence over both the pain and movement neurotags. Note that perceived current body position/location exerts a strong influence over the movement neurotag but not the pain neurotag. That movement prioritises protection is reflective of a highly complex and multifactorial process that promotes self-survival. Enhanced protective movement and behaviour has been demonstrated in a range of clinical pain disorders, where people in pain have upregulated defensive reflexes. In a recent meta-analytical systematic review (personal communication, 2015, Wallwork et al), we showed that the threshold at which reflex responses are triggered is lower in people with pain than it is in healthy controls, but that this augmentation could not be explained by tissue-based sensitivity, peripheral sensitisation or spinal sensitisation. Rather, the augmentation of these thresholds, appears to be driven by online descending facilitation. That is, it seems that the immediate and current evaluation of threat to body tissue modulates fine tuning of motor output right down to the level of short-loop reflexes. Moreover, the hand blink reflex is upregulated when the hand is closer to the face. This upregulation occurs in real time and indeed in a feedforward manner if the hand is moving (personal communication, 2015, Wallwork et al), but the upregulation is absent if a physical barrier is placed between the hand and the face.32 These results clearly show that a complex evaluative process associated with the perception of danger to body tissues modulates sensitivity of supposedly ‘automatic’ reflex motor responses. Applying the neurotag model to these discoveries, we can see that each of the cues, for example, the presence of a physical barrier, is represented by a secondary neurotag that influences the primary descending modulation neurotag. The effects of injury and inactivity on the cortical body matrix can be considered in terms of both the change in secondary neurotags that influence motor output and perception, and the effects of neuroplasticity. The idea that pain is simply a reflection of tissue state was elegantly dismantled several decades ago33 and there is now widespread endorsement of a truly biopsychosocial conceptualisation of pain in the scientific,34 clinical4 and lay35 ,36 ,37 literature outside of the sports rehabilitation field. 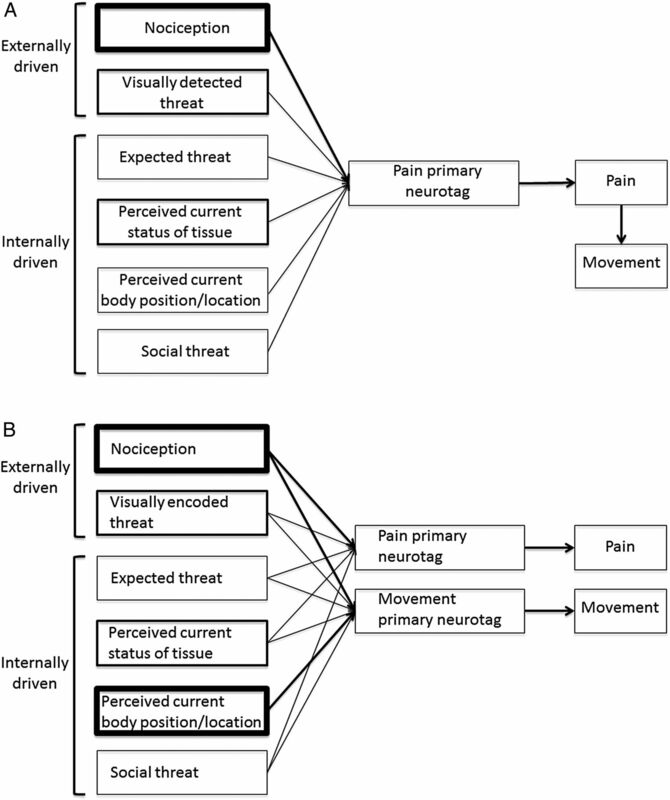 A modern conceptualisation of pain emphasises its multifactorial nature—a protective conscious feeling that compels the sufferer to protect their body from danger.38 As such, any information that implies danger to body tissue will be represented by secondary neurotags that influence the primary (pain) neurotag, making it more likely to fire. Any information that implies safety to body tissue will also be represented by secondary neurotags that also influence the primary (pain) neurotag, making the pain neurotag less likely to fire.35 This is conceptually simple even though the biological processes underpinning it are very complex and far from completely understood. The conceptual shift from the previous structural-pathology model to the current biopsychosocial protection-based model, is now seen as a therapeutic target, most obviously by explaining pain, a range of educational strategies that teach people about pain biology.4 ,35 ,38 ,39 Indeed, reconceptualisation of pain is now considered a fundamental objective of chronic pain rehabilitation.38 We contend that it should also be integral to sports rehabilitation. These principles extend beyond pain, however, to other protective outputs of the cortical body matrix, for example, fatigue, anxiety, fear, dyspnoea, stiffness and weakness, all of which can be conceptualised as protective feelings,40 and upregulated inflammatory response, increased cortisol production, elevated heart rate, all of which can be conceptualised as protective regulatory responses. The principle of neuroplasticity can be applied to sports rehabilitation in several ways. For example, repeated activation of secondary neurotags that represent danger to body tissue will increase their neuronal mass and precision, thereby increasing their influence on pain and the other protective outputs including motor output; decreased activation of primary performance-dedicated motor neurotags will decrease their neuronal mass and precision, reducing the likelihood that they will be activated. That is, the potentially broad range of neurotags that are associated with most sports, becomes less broad, and certain neurotags become less easily accessible when sought for a quick and efficient motor execution. According to Bayesian theory, this shift in propensity to engage the optimal motor outputs is conceptualised as reflecting fine tuning of the relevant neurotag based on previous experiences.41 We also make predictions about external environmental factors based on the probabilities of events that have occurred in the past, also called ‘priors’, and these probabilities are based on experience of such events. Therefore, the less often these movements are performed, the less efficient and less precise these movements become, by virtue of the reduced neuronal mass and precision of their subservant neurotags. The predictable consequence then, would be greater error in motor performance and an increased risk for further injury. Implicit motor imagery interrogates secondary neurotags, so deficits in motor imagery reflect problems upstream to movement execution—in movement preparation processes, for example. These reaction time tests provide two metrics—accuracy and reaction time—which are thought to reflect different aspects of the task, and therefore different sets of neurotags. Accuracy deficits are interpreted as reflecting disruption (decreased neuronal mass or precision) of proprioceptive neurotags that are then used for movement, and reaction time deficits are interpreted as reflecting disruption of spatial neurotags, whereby the neurotags that represent one side or area of space have greater neuronal strength than those representing another area and therefore exert a greater influence on the automatic decision stage of the task (see refs 8 ,52). Implicit motor imagery is easily assessed using commercially available software (eg, ‘Recognise’—noigroup.com, Adelaide, Australia) on computers, tablets or smart phones. Users can obtain immediate data on both accuracy and reaction time and keep online records to track performance over time. Clinicians can monitor patient practice and performance remotely. We would like to raise the possibility that the evidence obtained from clinical populations, and outside the sporting context, may be relevant to those with sporting injuries. Our own clinical observations seem to uphold this possibility and preliminary empirical studies are corroborative.67 ,68 Perhaps surprisingly, there are no systematic differences in motor imagery performance between those who do and do not participate in sport.69 In fact, that regular participation in yoga does not appear to enhance performance70 and that people who experience regular bouts of dizziness do not appear to have disrupted performance,71 strengthens the implication that disrupted performance is reasonably specific for disrupted body-part specific representations. ‘Sporting injuries’ are clearly not a homogenous group—the implications of the body of literature in this field are probably different for those with chronic or recurrent sports-related pain as compared to those with, for example, an acute cruciate ligament tear. Implications may exist for both, however. That is, the commonalities between chronic and recurrent pain problems experienced by professional, recreational or indeed ‘industrial’ athletes, suggests generalisability of findings across these groups. However, consideration of cortical representations in acute sporting injury rehabilitation is a relatively unexplored field. One might propose a role in the maintenance of coherent neurotags even when movement is not possible, but this idea has not, to our knowledge, been investigated. Nonetheless, we would contend that representation theory and the cortical body matrix theory, insofar as they relate to human behaviour and function, should be equally applicable to humans who are engaged in sport as they are to humans who are not. Clearly until empirical data are obtained, these contentions remain theoretical. As mentioned above, treatments that target secondary motor or tactile neurotags promote clinical recovery in those with chronic pain. Evidence is most established for graded motor imagery (GMI)72 (see ref. 8 for a comprehensive review) and tactile discrimination training53 ,54 ,73 ,74 (see refs 11 and 12 for relevant reviews) but other approaches are confined at this stage to case studies and observational accounts. The proposed mechanism behind GMI is that it uses a graded exposure paradigm to reinstate normal (non-protective) motor neurotags. GMI involves a three-step process; implicit motor imagery, explicit motor imagery (imagined movements) and mirror therapy.8 The sequence of steps appears to be important, at least for the severely disabling and painful condition of CRPS.75 Recommendations for GMI include performance during exposure to cues that signal danger to body tissue. Such cues are individually-specific but may include time of day, location, noise, competition, stress, fatigue, cognitive load, all of which may be addressed by simply modifying the context of GMI training. Importantly, GMI can be undertaken well in advance of physical rehabilitation. This is a key implication of this emerging field—that the normal decrease in neuronal strength and precision that occurs when a neurotag is taken ‘off line’ might be avoided by regular and varied ‘virtual’ training. GMI forms an empirically tested subset of imagery applications, but we contend that the principles captured by GMI should apply to less formalised application of motor imagery. That is, ‘neurotag maintenance’ might be as simple as motor imagery in the presence of performance-related cues. A thorough subjective examination about the injury and associations related to the injury could shed light on potentially threatening cues that could be integrated into neurotag rehabilitation well in advance of physical rehabilitation. For example, the extent and the context of the injury, the time of day the injury was sustained, the mood the athlete was in, weather conditions, background noise, other team players involved, might all constitute ‘cues of danger to body tissue’. To appreciate the potential importance of these considerations, one must only appreciate that each of these sensory and contextual cues are transformed into neural activity and therefore exert some kind of influence over lower level neurotags within the cortical body matrix. It is worth reiterating here that the influence of neurotags on other neurotags, and ultimately on outputs such as movement, immune responses and feelings, is determined by neuronal mass and precision and that both are open to modification via the principle of neuroplasticity. Tactile discrimination training can also be undertaken well in advance of physical and sporting rehabilitation. Such training involves a forced choice between at least two different tactile stimuli, relying only on somatosensory information to make that choice. The most tested protocol is to first identify several potential locations at which the participant might receive a tactile stimulus, stimulate at one location and ask the patient to identify which location was stimulated.53 ,54 ,74 ,76 According to the principles of neurotags, the nature of the stimulus is not important but the requirement to differentiate it from similar stimuli is. That spatial neurotags can also be disrupted implies that training spatial acuity will also offer benefits, although evidence for this is lacking and it remains, for now, conjecture. Perhaps surprisingly, there is a dearth of research on the use of such interventions for acute sporting injuries, despite known motor performance disruptions in association with such conditions. Those treatments could be delivered and tailored according to the outcome of assessments and according to the array of neurotags normally involved in the chosen sport; motor imagery tasks could be modified to interrogate sport-specific neurotags, for example, including context-relevant and equipment-relevant images. We have proposed that the principles that govern neural representations, or neurotags, are of fundamental importance to sports rehabilitation. We contend that incorporating neurotag assessment and retraining as a component of sport rehabilitation, in the light of tight inter-relationships between how our body is regulated and how it feels, will limit the deleterious effects of inactivity on neurotags, and hasten and optimise reinstatement of performance-related neurotags. We also contend that motor output and other protective outputs might be modulated by any credible evidence of danger regardless of whether or not the individual is in pain. If so, in situations where performance quality is key and executing a precise movement is vital, identifying and eliminating potential danger-related cues may be critical. Notably, the patient's understanding of the biological reasons to take this approach would also seem critical. Our contentions are based on a very large body of empirical work outside of the sporting context, but, as it is applied to the sporting context, it is limited to personal experience and anecdotal evidence. This is an important caveat and, in light of it, this review primarily serves to provide a provocative account of current thought in pain and cognitive neuroscience and possibilities for the sports medicine field. That some of the assessments and treatments that are based on these ideas are becoming more common in the sporting context does not constitute evidence of their prognostic or therapeutic value. Nonetheless, perhaps this review will spark a new conversation and line of research enquiry. Recent advances in theoretical models of pain and rehabilitation are relevant to sporting injuries. The brain's representation of movements and skills is a viable target for rehabilitation. Movements and skills can be thought of as outputs of ‘neurotags’. Recognised paradigms for understanding pain are applicable for understanding movements and skills. Broaden the assessment of those in pain to include domains implicated in modern pain-related theory.
. Rapid plasticity of human cortical movement representation induced by practice. J Neurophysiol 1998;79:1117–23.
. Explain pain. 2nd edn. Adelaide: Noigroup Publications, 2013.
. The graded motor imagery handbook. Adelaide: NOIgroup publishing, 2012.
. Trunk muscle control and back pain: chicken, egg, neither or both? In: Hodges PW, Cholewicki J, van Dieen JH, eds. Spinal control: the rehabilitation of back pain. Oxford, UK: Churchill Livingstone Elsevier, 2013:123–31.
. The explain pain handbook: protectometer. 1st edn. Adelaide, Australia: Noigroup Publications, 2015.
. Painful yarns. Metaphors and stories to help understand the biology of pain. Canberra: Dancing Giraffe Press, 2007.
. Pain. The science of suffering. London: Orion Publishing, 1999.
. In touch with the future: the sense of touch from cognitive neuroscience to virtual reality. Oxford: Oxford University Press, 2014.
, eds. Motor imagery training decreases pain on loading in people with chronic achilles tendinopathy: a preliminary rendomised cross-over experiment. Australian Pain Society 35th Annual Scientific Meeting, 2015. Contributors SBW and GLM contributed to the conceptualisation, planning, literature review and writing of this manuscript. VB and MC contributed to the literature review and writing of this manuscript. GLM is responsible for the overall content of this manuscript. Funding SBW is supported by an Australian Postgraduate Award from the Australian Government. GLM is supported by a Principal Research Fellowship from the National Health & Medical Research Council of Australia ID 1061279. This work draws on findings from projects supported by the National Health & Medical Research Council of Australia IDs 630431, 1008017, 1047317. Competing interests GLM receives royalties for books that are directly related to the material presented here and payments for the delivery of professional development courses. He consults to Pfizer and to Workers' Compensation Boards in Australia, Europe and North America.